Porsche is updating its successful 911 GT3 RSR for the new model year. The changes are made to ensure the 911 GT3 RSR remains very competitive in its field. Last season the old car clocked up wins at the Nürburgring 24 Hours and at the American Le Mans Series. It also competed in the GT2 class during international long distance races. The new GT3 RSR is based on the current Porsche Type 997. Improvements listed are numerous so only a few will be mentioned here, starting with the engine. Under the bonnet throbs the heart of a six-cylinder 4.0-litre engine whose capacity was upped from the familiar 3.8-litre. It delivers 450bhp (331kW) at 7,800 rpm and maximum torque of 430Nm at 7,250 rpm. Driving the rear wheels is a 6-speed sequential gearbox that works in tandem with a limited slip differential (LSD). The outside looks different from a number of angles. The bonnet features air louvers and the rear wing has a wider adjustment range. Its brake system has been weight-optimised and lighter wiring harness used in order to further improve the car's handling. Interior functionality is enhanced by programmes like a multi-function display on the dash that shows the most optimum time to change gears. A racing style bucket seat with a flame-resistant cover is fitted but only on the driver's side. 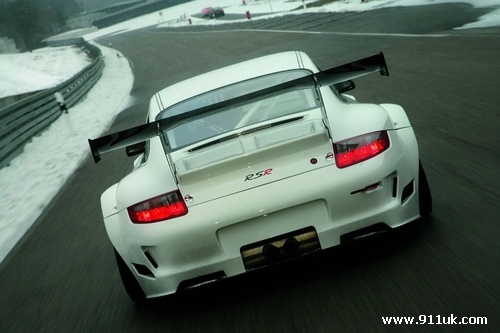 The Porsche 911 GT3 RSR costs €380,000 plus VAT specific to each country. that is really amazing car. i dreamed of that car. actually i am driving right now is the 2006 Porsche GT. here's some of the sample pictures. i just got this picture from google cause i don't have yet any picture of my car. i am tired of uploading it. well it is quite similar from this one, check it out. my car was sent to an auto repair to have some car recall because i found out something unusual happening.